Shopping for a good cheap road bike can be a bit of a challenge if you’re a woman since so many of the bike frames out there are made for the larger builds of guys. 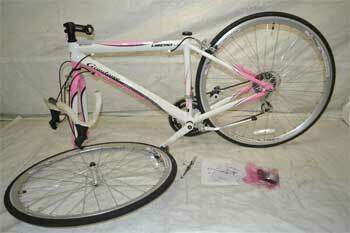 Fortunately, there are a few good options for women, like this pink and white women’s road bike from Giordano Libero. 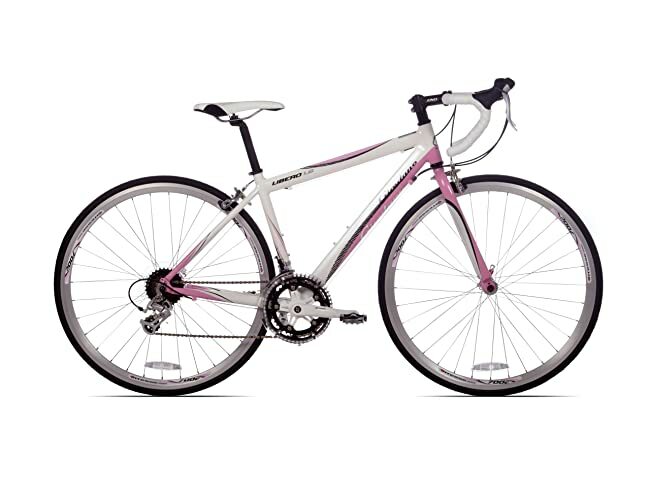 For me, the worst thing about the Giordano Libero 1.6 Women’s Road Bike is that it only comes in a pink/white color combo. You see, I am not a fan of the color pink and really hate that it is forced on females. But, if that is the worst thing that I can say about this bike, then you know that it is a really good one, eh? If you’re considering buying this bike, then let me share a little more info about it with you. If I want to sit higher with a longer pedal stroke, will this bike fit me? Does the Giordano Libero 1.6 women’s road bike have presta valve tires? How difficult is it to put this bike together? 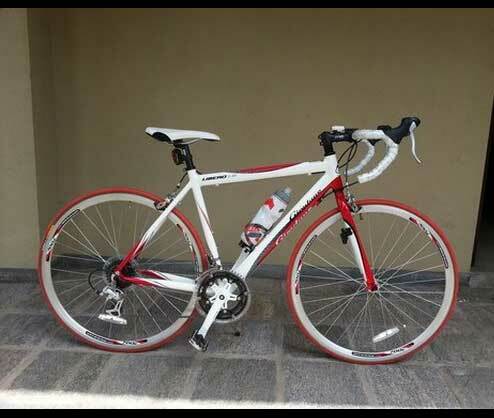 How is the ride on the Giordano Libero 1.6 women’s road bike? I really enjoy the design of this bike because it looks really nice. I just wish that it was available a color scheme that didn’t included pink. That being said, I would never let a ugly bike prevent me from giving something a try…even if it is pink with some flowered tape! Like most bikes out there, putting this together when it arrives is no big deal. You can actually get it assembled on your own. And like any other bike, it’s in your best interest to connect with your local bike shop and see if they can give it a tune-up before you head out for your first ride. The price for this will vary by location, but it will definitely be under $100. Think of it like this – if you ordered your bike online, then you saved a few hundred right there on the bike cost, so even after the tune-up you’re ahead financially still. Probably the worst thing about this bike is the seat. Personally, I find it to be on the uncomfortable side. Obviously, this is something that can easily be fixed with some padded cycling shorts. Or, if you don’t want to go that route, then you could even replace the seat with more that is a bit more kind to your derriere. A common problem with starter road bikes is the distance between your fingers and the shifters. Unfortunately, this bike has that problem. It’s almost like the designers thought we all had oddly long fingers, which results in the reach being quite the stretch. Fortunately, there is a very EASY fix to this. When you get the bike, there will be some extra rubber shims that you can put under the brake covers to reduce that distance that you’re stretching. When riding, this bike is very quiet and smooth. The gears shift effortlessly and the frame seems stable and lets you feel like you’re in control. Though the brakes are adequate, they certainly are not great. Of course, they can be replaced at an additional cost. My feeling about this is bike is that if you want a good starter road bike for women, then this is a good value for the money. It’s cheap, it’s made well, it’s lightweight and will last for several years. But, if you’re an experienced rider, then you’d likely be better off spending a little more money for a bike with better quality brakes and a more comfortable seat. But for beginners, I’m comfortable saying that this is one of the better models out there right now. No, this bike does not have presta valve tires. This means that you have two options if you want the presta valve tires – you can change the tires out immediately or you can wait until you need new tires and then change them out. You can get some Kevlar tires with presta tubes and put them on this bike with no problems whatsoever. When you order the bike, it will come in a box with the pieces all separate. While that may seem daunting, it is actually very easy to put together. All in, you can get it assembled in about 10 to 15 minutes. Of course, you’ll want to take it to a local bike shop for a tune-up before you go out on a ride. As soon as you get on this bike, you’ll find that it gives a nice, smooth ride. That being said, the seat is less than comfortable. I suggest getting a pair of padded bike shorts if you’re doing some serious riding to keep your bum comfortable on those long rides. Another thing that I want to point out is that if you have short fingers, then you may have a bit of a stretch to reach the shifters and breaks. Fortunately, the bike comes with some rubber shims that you can use use to lessen the distance that you have to reach. If you want some additional information on the bike, check out this video review that I found on YouTube.